The primary objective of this game is a simple one. You will need to swipe from the letter bank and then create different words as much as possible. If you take a look at the letter bank, you would realize that tons of words can be made from that you are provided with. As a result, you will be able to send a couple of hours trying to make new words. This is one of the best methods available for you to test your vocabulary skills. Here we have the list of all Word Guru levels and their answers. Just select the level you are stuck right now. The first thing you have to know about Word Guru is that it is FREE. There is no premium (paid) version of this game. The only thing is you can play in order to not see any ads (which sometimes are really disturbing). Download Word Guru for Android devices. Download Word Guru for iOS devices. Word based puzzle games have become extremely popular. Playing this type of game is an excellent method to pass time. In addition, people will be able to get something for their knowledge by playing a word based puzzle game. Out of the puzzle games that are available for the people to download and enjoy, Word Guru has received much attention. This can be considered as one of the best word puzzle games available for you to download and spend your time with. Word Guru Game has specifically been designed for the word gurus and people who are looking forward to become word gurus. As you can see, the objective of this game is a simple one. Therefore, you can easily get addicted to the game. Due to the minimalistic user interface, you would never get frustrated when you are playing this game as well. You just need to keep on swiping the letters in order to build words. This would be an exciting exercise that is available for you to go through. To make the game more interesting, the developers have added a large number of levels to it as well. Therefore, you would never get bored when you are doing the same thing again and again. Your main objective would be to complete the words and level up as soon as possible. When you level up, the complexity of words that you have to solve would increase. Therefore you will find it as a challenging experience to proceed with the game. When you are completing the levels, you will be provided with bonus levels to complete as well. You would love to discover these bonus words and enjoy the exciting returns that would come on your way. Some games have coupons codes or some kind of cheats like turning the internet off and no coins are removed from the account. Unfortunately Word Guru does not have any of these cheats and in reality you do not really need them. Just use our website to find the answers. Use the below form, just enter the level number and hit enter, you will be redirected to the page with all the answers. PS: There a paid app called “word Guru” (developed by Bryan Rolandsen), which has nothing to do with the game we all love so much. 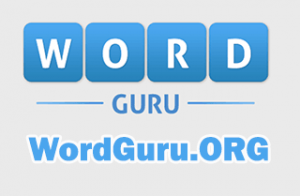 The real “Word Guru” is developed by “Word Connect Studio” and can be downloaded by this link here.